Why not build from scratch? What do you get with PortalProdigy? Why should an organization operate their systems over the Internet? Why are organizations using PortalProdigy more appreciated by their board members, staff, constituents, customers, vendors, prospects, members and the community? When can the public start using our website and all that amazing functionality the site? The PortalProdigy is an Internet Operating Platform developed for businesses and nonprofit organizations. Portal Prodigy, Inc. has isolated the best website features, processes and practices on the Internet and rolled them up into a uniform, easy to implement and reasonably priced Operating Platform. Using the PortalProdigy Internet Operating Platform, small and medium sized organizations can leverage the web without complications, without programming, without headaches and without changing the way they do business. PortalProdigy evens the Internet playing field against the largest competitors. Do you ever get the feeling that your organization could be doing so much more to take advantage of the Internet? It can! The web is more than just a place to hang your brochure. It’s a sophisticated machine for conducting all kinds of organizational activities. Contrary to what you’ve probably heard, taking advantage of this powerful phenomena doesn’t require overhauling your organization nor does it require major investment. PortalProdigy makes it easy to leverage the web without complications, without programming, without headaches and without changing the way you do business. How? By focusing on the real power of the web. Put aside all the nonsense about the “new” economy and the power of the web boils down to one word…..
You can have more interactions with more customers, more prospects, more suppliers, more employees, more members, more supporters, more constituents and more investors than ever before – faster than ever before – spending less money than ever before. Think about it. Before the web, interaction was one on one, linear, labor intensive and expensive. Today, it’s all changed! You could be interacting with millions of people simultaneously via the automation of the Internet a thousand times faster at a fraction of the cost. Many organizations are leaping ahead of their competitors by automating the three fundamental organizational interaction types which are super accelerated by the Internet. We call it "Internet Interaction Management ™"
You can leap ahead by implementing PortalProdigy, the only website configuration tool that can have you conducting transactions, sharing knowledge and building community -- instantly! It's all prefabricated. You simply add your organization's personality and go. At PortalProdigy, we’ve studied the very best the Internet has to offer. Then we adopted the greatest features, processes and practices from Internet pioneering organizations of all types and rolled them up into a uniform, easy to implement and reasonably priced package. Implement Portal Prodigy today and by tomorrow your organization can be online doing everything listed below and more! PortalProdigy was developed to save your organization time and money while increasing its ability to accomplish its mission. PortalProdigy provides a central facility which affords everyone involved in your operation the opportunity to participate remotely, guided by standardized practices and procedures. Using a simple Internet Browser any authorized employee, customer, vendor, prospect, volunteer, staff, constituent, advisor, members or contributor can perform virtually any and all administrative and operational activities and the results are immediately available to the organization in real time. You could hire a programmer and use some page builder to develop your website from scratch. But then, that’s probably what you’d end up with, a website. Would you build your entire accounting system from a spreadsheet application? Or, would you use QuickBooks? PortalProdigy is a complete system. It took a full staff of experienced engineers and programmers several years to build, test and document PortalProdigy. Why would you re-invent the wheel? While you and your managers are playing software developer, your competition will be online with PortalProdigy leaving you in the dust. PortalProdigy comes complete and ready to go. No need to add modules. Just add personality and you are up and running instantly. You don’t even need to install expensive servers and bandwidth. We run the equipment for you. Oh, and by the way. PortalProdigy comes with a WYSIWYG (What you see is what you get) page builder installed. Just in case you need to build pages from scratch. It’s like using a word processor in your browser window only it automatically converts your work into HTML when you save it. You don’t even have to know how HTML works. It’s easy to use and can be operated from a browser anywhere. Instant Internet functionality is what you get. Your installation is fully equipped with all the functionality we’ve developed. It’s simply a matter of choosing configurations and loading your content. Secure Online Administration Menu – When PortalProdigy activates your Web Interaction Management Website, you’ll be provided an administrator login and password. Using your Microsoft Internet Explorer browser, you’ll login to the Administration menu which provides access to configuration and control of the entire system. The features you’ll be able to control immediately are described in the following paragraphs. Contacts Feature - Maintain detailed records on individual contacts such as prospects, customers, members, employees, etc. The individual Contact Records serve not only as a place to record and lookup contact information such as ad-dresses and phone numbers but also a link into other features related to individual contacts including event registration records, contact management, advocacy participation, contributions, purchases, exchanges and more. The Contact database further serves as a data merge source for message broadcasting via email, fax or printed communication features. Contact Management & Tickler/Notes Feature - Task, Action and Prospect Organizer - Provides for the attachment of notes and event triggers to records within many of the features of PortalProdigy. Special fields are provided within each note allowing for categorization by status, type, follow-up date, and delegation contacts so that they may become part of any assortment of planning, reminding, delegating and task organizing systems that can be easily customized to each organization’s private PortalProdigy installation. Public Relations Feature – Provide permitted visitors an opportunity to create and update their own Press Release Template and Biographical Record and send press releases. Media contact records are stored in the contact database and classified by medium, news category and geography. Permitted visitors enter press re-lease copy into the website form and indicate media contact preferences by medium, news category and geography and PortalProdigy delivers the press release in HTML format via email to the appropriate media contacts. Media Contacts can click on a link in the email press release they receive and are brought to the organization’s site where they can not only read detailed information on the sender of the press release but also search the biography database for other people and companies of interest. This feature is especially ideal for professional and trade associations, advocacy groups and sporting leagues. Companies - Maintain records on individual companies, including their relation-ship to individual contacts when applicable. Individual Company Records serve not only as a place to record and lookup contact information such as addresses and phone numbers but also a link into other features which relate to companies. Credit Apps - Add, view, report, approve and decline credit applications. Broadcaster - Create message templates which execute manually, upon schedule or when triggered by a process event to broadcast email messages to specified individuals, contact types or interest groups. Includes the ability to insert variable data from an assortment of PortalProdigy features. Also can be used to export contact data into .CSV format files which may be used with any fax broadcasting or word-processing software with merge capabilities. Directories Feature – Create public contact directories for an unlimited number of categories such as Board of Directors, Members, Users, Experts, Media Contacts, Service Technicians, Sales Reps, etc. Individual directory access may be constricted to visitors with specified security permissions and display only information specified in their administrative setup. Includes sophisticated directory re-cord search interface. Discussions and Web log (Blogger) - Create public or private Discussion Forums. Provide visitors the ability to interact with each other or with specified groups. Includes searchable archives make this feature ideal for propagating user self-help groups. 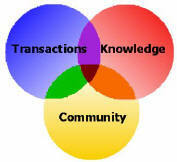 Powerful hyperlink insert tool makes this a serious community builder. Ask the Expert – Many experts will pay for the opportunity to be listed as an expert contact on your organization’s website because this feature provides them with a special one on one lead situation. Define your expert categories, enter expert member types into the contact database or let them signup online. Visitors link to the Ask the Expert page and post their question, select an appropriate expert category and submit. Each expert in the category receives a copy of the question via email and responds privately to the submitter. Unlike discussion forum, blogging and newsgroups, Ask the Expert conversations are private between the expert and the submitter. Document Library - Maintain a visitor friendly cataloged, searchable and browsable document library that includes documents stored in their original file formats such as HTML, PDF and TXT. A database record with descriptive information and administrative controls is created for each document imported into the website. Documents can be assigned viewing security levels, expiration dates, catalog locations, topics, and index keywords and phrases. The Document Library can serve as a knowledgebase for visitors and the organizing store house for unlimited website pages. It’s easy for permitted users with no website or HTML programming experience to import documents directly from their computer or network into the organization’s website. Documents created in MSWord, Publisher, and other desktop publishing software are quickly made part of the website with no programming required. Events Manager – Schedule programs and events, enter details and import event brochures, registration forms, maps, etc from any computer into event records on the organization’s website in order to furnish visitors with an event calendar, pro-gram information and signup ability. Event details, contact information, registration limits, seating inventory, pricing and payment options can all be input, up-dated, tracked and reported. Visitors can register and pay online using credit cards or other payment options. Attendance lists and badges can be printed locally from any printer connected browser. Event notice email broadcasts may be scheduled in advance and sent automatically when appropriate. If desirable, a view current registrants link can be available to visitors. Online Product Catalog – Feature, display, demonstrate and sell your organization’s products online. Define an unlimited number of product categories and hierarchy of sub categories. Enter detailed descriptions, categorize products, display pictures, setup inventory and selection by colors and sizes, enter initial inventory quantities, attach full featured multimedia product brochures, and track inventory manufacturer, purchasing and cost information. Exchange Engine - Create public participation exchanges such as resume and job posting boards, vendor operated catalogs, trainer or speakers bureaus, and other visitor operated organization sponsored bazaars or markets. Define a virtually unlimited number of exchanges which can be public or private, free of charge or on a fee paid basis. Payment for participation can be accepted online using credit cards or other payment options. The Exchanges Feature differs from the Online Product Catalog Feature in that it fosters commerce or exchange between a de-fined group of external participants, such as members and service providers, which does not involve your organization directly. Legislative and Regulatory Calls to Action Feature - Rapidly mobilize constituents into a focused force. Broadcast Calls to Action messages via email to specified individuals, contact types or interest groups. The messages include a hyperlink recipients can click, bringing them to the website’s issue position and education page. Respondents can choose to respond online to their legislative, regulatory, judicial or executive branch representative as predetermined by an Administration setup function. Each LRCA project can include suggested response messages to aid respondents in developing their own message. Respondents type their message into the website LRCA response form. PortalProdigy uses their zip code entry to determine the respondent’s correct legislative, regulatory, judicial or executive branch representative and sends their message. Membership Types – Provides a highly flexible system for offering, promoting, signing-up and managing members online. Not to be only narrowed to “member-ships” as in a club or association. Instead, think of members as a specifically privileged group such as employees, specific department staff, managers, contributors, parishioners, reporters and journalists, constituents, vendors, customers, prospects, etc. Classify groups of contacts in order to control access to specific website functionality and to trigger events specific to given membership types -- events such as billing, program notifications, surveys, news delivery, exchange announcements, press releases, etc. You can even use Membership Types to sell or control subscriptions to publications and other features. Memberships can be free or fee based. Renewal invoices are generated automatically for the appropriate monthly, quarterly or yearly membership term and automatic privilege cancellation can be set for unpaid membership terms. News - The News Feature provides a rapid entry interface used by Administration to enter news items. Headlines are displayed on the homepage where visitor can click on individual items of interest to view the detailed news record. Publication Manager - Provides a publishing facility which fosters the regular publication of newsletters, releases, briefs, reviews, etc. with consistent format from issue to issue. An unlimited number of custom Publication Templates may be created ahead of publication for printed format, HTML format and email text format publications. Multiple content and editorial contributors can participate simultaneously adding and updating content at their convenience until date of publication. Publications can be automatically broadcast to specified individuals, contact types or interest groups via email. Print format Publications can be merged with name and address data from the Contact Database for specified individuals, contact types or interest groups and printed on any remote users printer or saved to a digital file and brought to a digital printing service such as Staples, Sir Speedy, Kinkos, etc. for printing. Past publications may be displayed online in public or private archives based on type and topic. Surveys - Conduct surveys online. Create surveys with an unlimited number of questions using multiple choice, true/false, rating or text answer formats. Survey notices can be automatically broadcast to specified individuals, contact types or interest groups via email. Message recipients click on a link bringing them to the corresponding website survey page where they answer questions and submit their results. Survey results are stored by PortalProdigy and reported when needed. Orders Feature – Manage and fulfill orders for products as well as events, exchanges, membership and Press Releases. Invoicing – The Invoicing Feature is used to print and post invoices. It provides the option to print invoices to a printer or to create in HTML format for electronic delivery by email. Statements – The Statements Feature is used to print statements of financial transaction activity for a specified period including previous balance, new in-voices, payments received, and current balance owed. It provides the option to print statements to a printer or to create in HTML format for electronic delivery by email. Membership Billing – The Membership Billing feature is used create and post invoices for membership fees. It provides the option to print the membership invoices to a printer or to create in HTML format for electronic delivery by email. Payments – The Payments Feature is used to enter payments and apply payments, credit memos and debit memos to Orders. It is also used to create credit memos and issue refunds. Chargebacks – The Chargeback Feature is used to enter bank charge-backs for unpaid deposits such as NSF checks, credit card charge denial, or protested credit card charges. It provides a convenient method of entering and posting charge-backs as a batch. Fulfillment – The Fulfillment Features provides an automated process for fulfilling Product Orders. It provides the ability to select Order Items for fulfillment based on specified criteria, assigns the selected Order Items to a batch, produces a picking list for the batch, provides the ability to adjust the fulfillment and processes the results, updating the Orders. Promotion Codes - A powerful tool for increasing sales, attracting new customers, and generating repeat sales from existing customers. PORTALPRODIGY’s Promotion Code feature greatly simplifies the process of creating and managing promotions for both products and services. It also makes it easy to target specific categories of customers offering specialized promotions to targeted groups. Inventory Entry – The Inventory Entry Feature is used to enter new inventory. It provides a quick and simple method of updating inventory. Inventory Adjustment – The Inventory Adjustment Feature is used to enter manual adjustments to inventory. This is used to adjust inventory quantities up or down based on a physical count or for damaged goods. About Us - The About Us Feature provides a boilerplate entry form for creating an About Us page in accordance with traditional website best practices. During site setup, Administration can use this feature to create the organization’s About Us page. Contact Us - The Contact Us Feature provides a boilerplate entry form for creating a Contact Us page in accordance with traditional website best practices. During site setup, Administration can use this feature to create the organization’s Contact Us page. Color Scheme - Mechanism for customizing the graphic look and feel of the website through the selection of color for specific objects, backgrounds and fonts used by the site’s templates. Table Builder Utility - A boilerplate entry form for creating an Our Experience page in accordance with traditional website best practices. Greeting Utility - Provides a boilerplate entry form for creating and maintaining the organization’s Home page in accordance with traditional website best practices. Universal Site Settings - The Features – Universal Site Settings Feature provides for configuration of the website, its functionality and feature activation. Administration can turn features on and off from this console as well a set certain universal property, limit, requirement, selection list and topic values for specific features. Logo and Name Utility - The Logo and Name Feature provides an interface for importing brand graphics into the website which are used in the website template to customize its appearance to project the organizations image in accordance to its standard motif. Site Style Template Chooser - Provides for the selection, from a catalog of available templates, of a specific pre-designed graphic website style which is the basis of visitors’ visual experience of the site. The selected template becomes the visual foundation of the entire visitor’s portion of the website. The selected tem-plate can be customized using the Color Scheme and Universal Site Settings con-soles. Security and Special Interest Groups - Security Groups are used to control visitor access to the website and its features. Special Interest Groups are used to isolate specific contact records for the purpose of inclusion in certain features. For example, inclusion in a directory, exchange or a specific email broadcast. Utilities – A set of specialized tools generally used for data and website maintenance, data import, and configuration. advertise jobs, products and services. accept applications, resumes, credit applications, service requests, etc. initiate calls-to-action and facilitate massive “grass roots” lobbying and petition-ing response campaigns. create a searchable repository of corporate documents, manuals, forms, etc. promote communication among tens of thousands of geographically diverse peo-ple who share a common interest. sell and download digital content such as books and music. Why are organizations using PortalProdigy more appreciated by their board members, management, staff, constituents, customers, vendors, prospects, members and the community? It’s simple. PortalProdigy makes Internet implementation simple, quick and easy. Furthermore, dealing with your organization becomes simpler, faster, easier and less costly. The World Wide Web gained mass appeal faster than any technology in history, including the wheel. That’s true! Why? Because it is fantastic. It brings people closer together and that’s who you do business with -- people. You’ve heard it before, the separation between the have’s and have not’s is getting wider fast. Don’t be left behind. You must implement real Internet functionality now, not some cheap flat web brochure, or you’ll be left behind. PortalProdigy will get you there quickly, easily and economically. When can the public start using our website and all that amazing functionality?